More than half a million pieces of space junk are in orbit floating in and around operational missions. 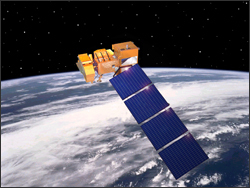 In coordination with NASA, the USGS keeps constant vigil to avoid space debris that might collide with the Landsat 5 and 7 satellites. On April 17, 2012, Landsat 7 maneuvered out of the path of a piece of debris that was on a collision course with the spacecraft. This move will affect the location of the data imaged. As a result, the geographic coverage of collected imagery will drift to the west until the easternmost portion of the scene will be missing as compared to previous acquisitions. The most affected region will be the Tropics, which will begin seeing a small offset on or around April 25. The westward movement will continue until the USGS Flight Operations Team can maneuver and reposition the satellite to its proper orbit. This process is expected to take approximately 2 months, and the USGS will continue to acquire data during this time. Details about returning to nominal orbit will be announced when they become available.